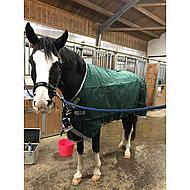 The blanket is equipped with the Horseware Liner system. 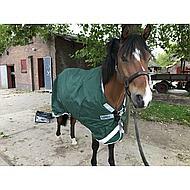 This allows you to change the blanket in a warm winter outdoor blanket, in combination with various matching covers. 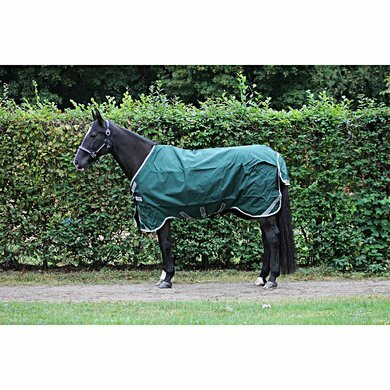 The blanket is suitable for almost all pony and horse breeds thanks to the Surefit Neck Design. This fit on the front of the blanket delivers a more universal fit. 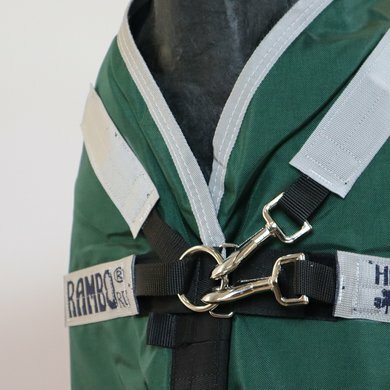 In addition, the Rambo Turnout is equipped with leg recesses (Leg Arches). 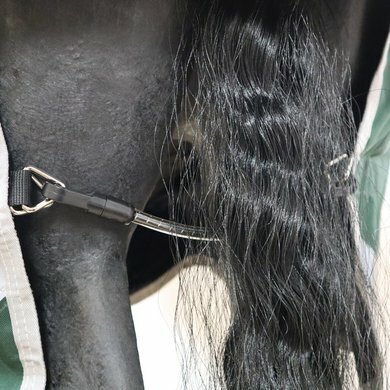 This means that there are recesses for the legs of your horse so that movements are not restricted in any way. Both Leg and Legs have been applied to both front and back, in order to prevent obstacles in any way. 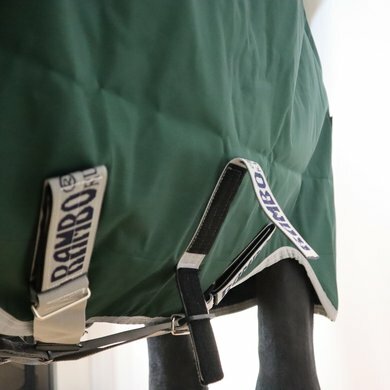 The blanket features a V-closure, which is also known as the V-Front Closure System, and ensures that your horse can graze undisturbed without being obstructed. 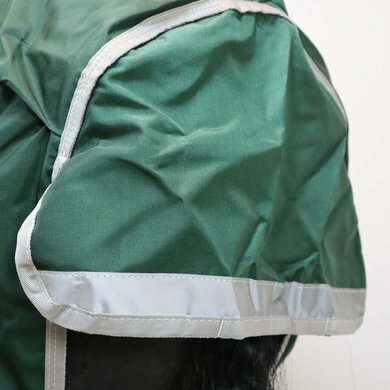 This system also ensures that the pressure on the shoulders and legs is divided, which greatly reduces the risk of pressure and abrasion. 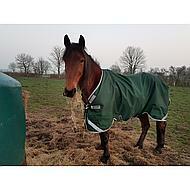 The inside of the blanket is fitted with a permanent polyester antibacterial layer. This action limits the growth of bacteria, fungi and mites. This layer reduces the risk of infections and allergies. 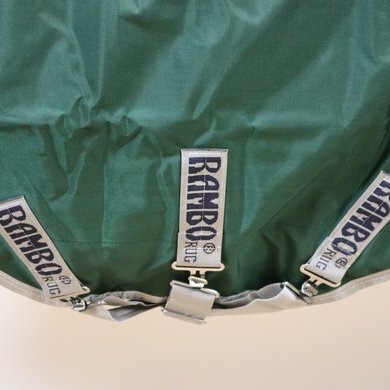 Unique to the Rambo blankets is the 3 single lock system. Thanks to this system, the blanket closes nicely around the stomach, without scratching the shoulders. You can close the crucifixes cross or right, just what you find the easiest. 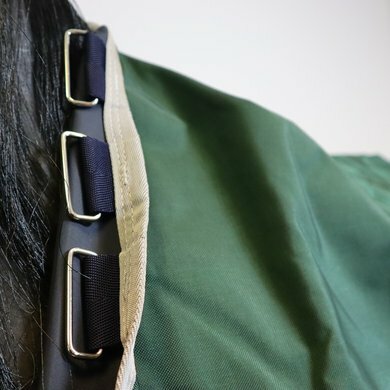 - Outer fabric: Ballistic nylon. - Inside lining: Smooth antibacterial polyester. - Watertightness: Aquatrans 3000 mm / m2 24 hours. - Breathability: 4000 g / m2 24 hours. 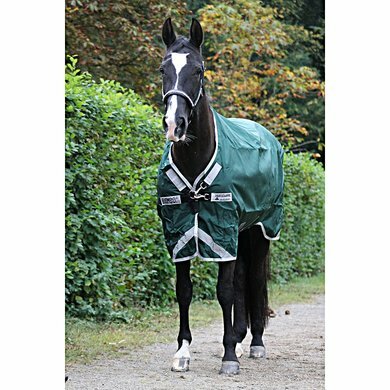 - Fit: High-Neck, Leg Arches, Surefit Neck Design, Horseware Liner System. - Brush closure: V-Front Closure System. - Other closures: 3-Single System with Quick Relesase, Single PVC Coated Car Strap. - Stainless steel closures: Yes. - Neck: Yes, available separately and connection through rings. - Available in sizes 165cm to 220cm. I have not had the blanket for a long time, but it makes a very good impression. Fits well, keeps tight, sturdy and beautiful color. The closures look very secure, neck piece and liner are also easy to attach. Super quality! 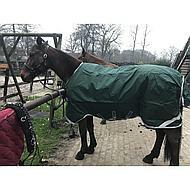 Waterproof blanket that stays really waterproof in the event of bad weather. It only rains a bit at the withers, as with all blankets. From now on I will do the washing myself, since my previous Rambo was leaked at the laundry. 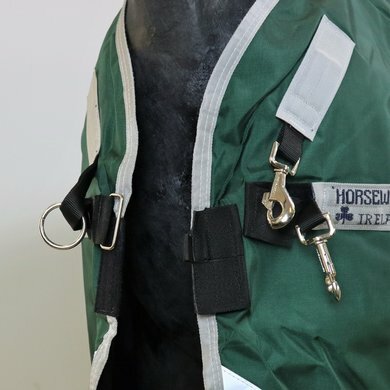 Nice fit, also for horses with somewhat shorter shoulders and legs. 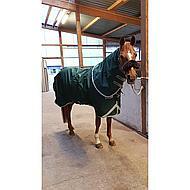 On my round pony of 1.48 is a 185 blanket. 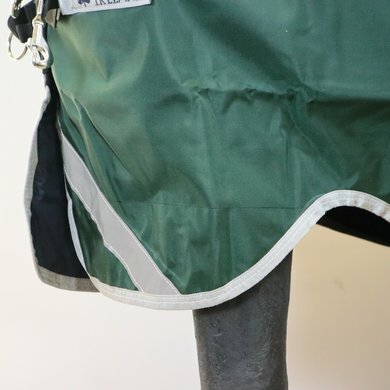 Handy that liners can be covered, so only in wet weather do they get wet when the blanket is raining. With normal lining you have that of course. 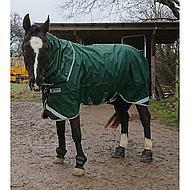 Robust blanket that always stays neatly on, nice and light in weight too. Super color and fit, unfortunately she has a 3 cm crack after a short time. Stands only with another horse on paddock. All in all, not unbreakable, but still very robust. We put this blanket over the stable blanket in the winter, and it stays super. This blanket is also waterproof for a few years. This is my second blanket from Rambo and I never want anything else. The closures are also super fine and the blanket dries very quickly. What a nice blanket! Nice quality and fits well. A bit pricey but it has been going for 2 years now, with cheaper blankets always having to be replaced because they broke. So in the end a lot cheaper. Ideal that you can attach the bottom blankets well. Can recommend it to anyone who doubts! Question: Equipped with rambo liner system? Answer: This blanket is indeed equipped with the liner system. Question: Can you attach a neck piece with velcro to this blanket? Answer: Yes, the neck part can be found under article number HW-AAAAN0-GI00-SM. This is also available in a set with the blanket. Question: Is this size 5.9? Answer: This blanket is indeed 5'9 feet.